Bast fibers used in cultural properties come from a variety of sources including hemp, ramie, kudzu, and bashō (Japanese banana). As discussed in the May 2017 monthly report (Takuyo YASUNAGA , “Historical Position of ‘Hakubai-zu byobu’ by Goshun－A workshop is organized by the Department of Art Research, Archives and Information Systems”), we have learned in the more recent years that in addition to silk and paper, bast fiber is also used as the support medium in paintings. There are no well-defined, established methods of identification, however, in part due to the difficulty of discerning the characteristics of individual fibers once in textile state. Tokyo National Research Institute for Cultural Properties (TNRICP) is working to find a solution to these and other problems, in a cooperative research effort into bast fiber identification among the Department of Art Research, Archives and Information Systems; Center for Conservation Science; and Department of Intangible Cultural Heritage. 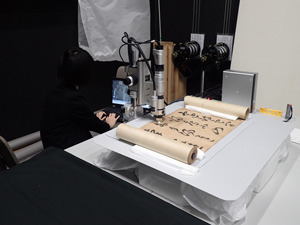 As a part of this research, the three-dimensional forms of fibers in a calligraphy work and a dyed article made of bashō-fu (textile woven from banana plant fiber) were examined using a digital microscope at the Okinawa Prefectural Museum from January 22nd to 23rd, 2019. Bashō-fu is textile developed in Okinawa and Amami Islands and has been designated an important intangible cultural property, with Ms. Toshiko TAIRA recognized as an individual practitioner and Kijōka Bashō-fu Preservation Society recognized as a heritage protection organization. Of the work examined this time, the calligraphy work is known to have been created in a particular year and the dyed article is an item whose wearer can be guessed at. The examination showed that despite being all works thought to be made of bashō-fu, the look and the feel of the textiles varied due to differences in yarn density and yarn processing method. While it is difficult to judge whether the differences are rooted in regional variation within Okinawa and Amami Islands or due to differences in use, we were able to conclude that many kinds of bashō-fu were created through different processes. Accurate identification of bast fibers goes to the most basic data on a particular work, and is a key element in considering the circumstances of production. It is also a pressing issue in the organization of basic data for use in the present repair or the passing on to future generations of intangible cultural heritage. We hope to continue furthering the research into identification of bast fibers through field investigations into techniques in conjunction with examination of exhibits at museums and art museums. Located in Norwich, the county capital of Norfolk, SISJAC is among the prominent institutions of studies on Japanese arts and culture in Europe. 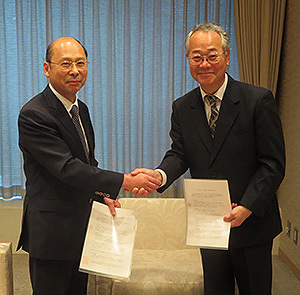 Since 2013, SISJAC and Tokyo National Research Institute for Cultural Properties have been working on a joint project—“The Project to Shaping the Fundamentals of Research on Japanese Art”—through which documents related to Japanese art that are written in English and published outside Japan are provided by SISJAC and made available on the Institute’s website. Also, as part of the project, researchers of the Department of Art Research, Archives and Information Systems have been visiting Norwich annually to hold consultation with SISJAC and conduct lectures on related topics. In fiscal 2018, two researchers, Tomoko EMURA and Takuyo YASUNAGA, visited Norwich from November 13th to 16th to achieve the mission. During the consultation, various issues were addressed, including low number of access to the data provided by SISJAC and problems caused by special English characters and inconsistencies in romanized Japanese characters in entering data. In response, the Institute presented an estimate of the number of access to the data and its future policy to standardize the entry of special English characters and romanized Japanese. 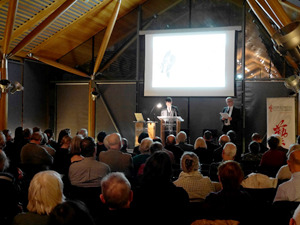 On November 15th, YASUNAGA gave a lecture entitled “A pair of scroll paintings: The triple images of Yosa Buson’s ‘Kite and Crows’” at the Weston Room of Norwich Cathedral, with interpretation provided by Dr. Simon KANER, Executive Director of the Sainsbury Institute. The lecture was conducted as part of a regular lecture event focused on general audience and offered by SISJAC on every third Thursday of the month. This event enjoyed an attendance of about 80 people who listened with much enthusiasm, showing the popularity of Japanese art in the UK. 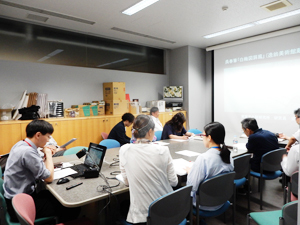 The Department of Art Research, Archives and Information Systems of the Tokyo National Research Institute for Cultural Properties organized a workshop on May 30, 2017, when Takuyo YASUNAGA (a researcher of the Dept.) gave a presentation on research titled the Historical Position of “Hakubai-zu byobu” by Goshun (housed by the Itsuo Art Museum). After working as a disciple of Buson YOSA, Goshun (1752-1811) inherited Okyo MARUYAMA’s painting style. Goshun is known as a painter who established a painting school called the Shijyo school. One of his representative paintings, “Hakubai-zu byobu (the folding screen of white plum blossoms)” (an important cultural property) is a fantastical piece of work in which a small earth mound and three white plum trees that spread their branches are drawn on a pair of six-panel folding screens to which a coarse-grained fabric made from pale blue-dyed yarns is applied. These screens are estimated to have been produced between 1787 and early years of the Kansei era (1789-1801) based on a technique called tsuketate he employed in drawing the branches of plum and a style of calligraphy for his signature. They are one of the examples that were created when Goshun changed his painting style from a Buson style to the Okyo counterpart. As the initial step, YASUNAGA analyzed the expressions and materials of the painting meticulously, thereby shedding light on issues of incorporating an Okyo style in a painting on the subject of plum. He then went on to point out that a Nanpin style based on the learning of Buson’s paintings and an influence of Chinese paintings were identified in its unusual background expression on the fabric made from pale blue-dyed yarns. Furthermore, with respect to the use of a quite special base material that appears to be a cloth made from kudzu, YASUNAGA extrapolated the base material of the work through a comparison with some examples that use such cloth by other artists than Goshun. He also indicated that the use of such cloth was possibly associated with interaction between Goshun and men of letters in Ikeda. After his presentation, he was bombarded by questions about the use of this special base material and lively discussions were conducted on the possibility of its identification. It has been said that the seals Ogata Korin (1658-1716) used on his paintings changed with his age. The seal used on the folding screen of “Irises” (Nezu Museum), which is one of his masterpieces of his early period, is the “Iryo” seal, while he used the “Hoshuku” seal on his later masterpiece “Red and White Plum Blossoms” screen (MOA Museum of Art). The “Dosu” seal was used during the period between the years when the “Iryo” seal was used and the years when the “Hoshuku” seal was used. During this period, Korin stayed in Edo a few times and it is believed that his painting style has changed during this period. There are other works of his with the “Dosu” seal, including the “Flowers and Grasses of the Four Seasons” handscroll painted in 1705 (Private Collection) with ink seal on the frame, the “Rough Waves” screen (the Metropolitan Museum of Art), and the “Azalea” hanging scroll (Hatakeyama Memorial Museum of Fine Art). This time, especially focusing on the “A Budding Plum Tree” (Freer Gallery of Art), which is a six-panel screen that have been less known, the presenter has indicated that elements implying the change towards his later masterpiece “Red and White Plum Blossoms” screen are observed in it. The “A Budding Plum Tree” screen has many damages and bears traces of a lot of trial and error in his touch. Korin is believed to have learnt the black-and-white ink painting style during his stay in Edo and this experience could have affected the change in his painting style. The presentation was followed by a active discussion, where opinions were exchanged on possible relations with change of seals, shapes of his screens, and black-and-white ink painting style. A more detailed study on the “A Budding Plum Tree” screen is awaited. Tokugawa Yoshimune, the eighth shogun of the Edo Shogunate (1684-1751), is well known as an innovative yet reactionary politician. Also in the field of art, he encouraged the reproduction of Chinese masterpieces painted in the Song, Yuan and Ming Dynasties, while allowing the import of Dutch oil paintings. He also ordered the reproduction of old paintings possessed by feudal lords and the sketching of rare animals from abroad. One of the leading painters who reproduced such old paintings and made such sketches is Okamoto Zen’etsu Toyohisa (1689-1767), who served Yoshimune as a painter in the Doubou rank. Ms. Kato introduced the fact that approximately 270 painting examples called Funpon, which had been formerly owned by the Hikone Family as a descendant of Zen’etsu, were included in the “Pictorial Materials of the Itaya Family” possessed by the Tokyo National Museum. Based on the existence of these materials, Ms. Kato pointed out the possibility that Zen’etsu might have played an important role in leading visual arts and iconography by communicating the intention of Yoshimune to the Kano and Sumiyoshi Families known as long lines of great painters. These issues clarify Yosimune’s perspectives on paintings, suggesting that Yoshimune’s views affected the style of the Kano school later by way of Zen’etsu through the accumulated example paintings. After the presentation, there was an animated discussion over the roles of Zen’etsu and his relation with Narushima Douchiku as one of the close advisors to Yoshimune like Zen’etsu. We expect further discovery of works created by Zen’etsu, who actually produced a few paintings only. 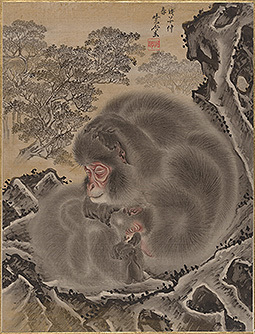 “Monkeys” painted by Kawanabe Kyosai, in the Kindai Nihon Gajo album of paintings possessed by the Metropolitan Museum of Art. The Art Research, Archives and Information Systems held a monthly workshop on the topic and with the presenters mentioned below on June 4. On the topic of “Sansui Zukan,” a painted scroll in the Edo period that is said to have been painted by Gion Nankai and depicting the Kumano pilgrimage routes running from Wakayama to the Nachi falls via Nakahechi, Hongu, and Shingu, Ms. Yasunaga discussed the possibility of the work having been painted by Gion Nankai [1676-1751], based on the geographically accurate depiction of Kumano and the characteristics of its expression by comparing the scroll with Nankai’s other newly found works and other measures. In addition, she also pointed out the scroll’s relationship with the learning activities of Chinese paintings by early Japanese bunjinga (literati painting) painters and new expressions of actual sceneries. However, attendees of the workshop provided various remarks such as the issue of whether the painting scroll was just a sketch and the relationship with other paintings of the same age. Ms. Tomizawa made presentations based on the survey of “Kindai Nihon Gajo” possessed by the Metropolitan Museum of Art in New York. While paintings included in this gajo are separated individually at present, it originally consisted of 95 paintings created by seven Japanese-style painters who were active in the Meiji era, including Kawanabe Kyosai, Hashimoto Gaho and Kawabata Gyokusho. Ms. Tomizawa’s research revealed that dealer and collector Francis Brinkley (1841-1912) originally asked Kyosai to create an album of 100 paintings. However, as Kyosai died in 1889, the creation of the album was divided among the other six painters, according to her research. Charles Stewart Smith, a prominent U.S. entrepreneur who stayed in Japan in 1892 and 1893, purchased the album from Brinkley and Smith’s bereaved family donated the album to the Metropolitan Museum of Art. The album remains in the museum’s possession to this day. Among the paintings included in the album, 12 painted by Kyosai were temporarily returned to Japan and exhibited along with their sketches (possessed by the Kawanabe Kyosai Memorial Museum) at the exhibition “KYOSAI-Master painter and his student Josiah Conder” held at the Mitsubishi Ichigokan Museum, Tokyo, in the Marunouchi district of Tokyo from June 27 to Sep 6. The elaborate brushworks are prominently respected among other paintings in the album, so we recommend that you see them on this occasion. On June 30 (Tue. ), the Department of Art Research, Archives and Information Systems invited Mr. Matthew Mckelway, professor at Columbia University, and held a workshop titled “NAGASAWA Rosetsu before his Sojourn in Nanki (Kii Province): His Relations with Temples of the Zen Sect”. Rosetsu Nagasawa (1754～99) is a painter who was active in the mid-Edo period. Substituting for his master Okyo Maruyama, Rosetsu visited several temples of the Zen sect in the southern Kii Province (Nanki) from 1786 to 1787. Rosetsu is known as having drawn a large number of sliding panel paintings during his sojourn of a few months. His experience in Nanki gave him significant momentum to obtain his own painting style. However, there are quite a few unclear points over Rosetsu’s movements and painting education before his sojourn in Nanki. 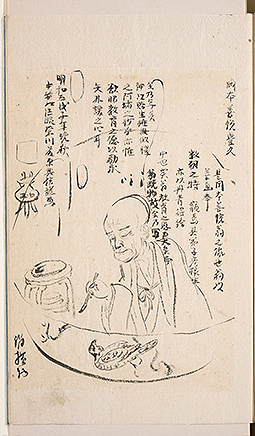 Based on a detailed analysis of a sanja (person who appreciates the work and writes an appraisal of it) of Rosetsu’s works currently possessed in overseas countries and his collaborative works, among other materials, Mr. Mckelway pointed out that Rosetsu had had close relations with Zen monks at Myoshin-ji temple such as Shikyo Eryo and Shishin Sogin since before his sojourn in Nanki. By examining the motifs of Rosetsu’s sliding panel paintings at temples in Nanki with this fact in mind, Mr. Mckelway also pointed out the possibility that Rosetsu was inspired by a sliding panel painting at Myoshin-ji temple. Given that the current research on Rosetsu lacks works before his sojourn in Nanki, Mr. Mckelway offered a very significant and attractive theory. After his presentation, there was an active exchange of views on Rosetsu’s works in overseas countries introduced by Mr. Mckelway. Such a presentation about works possessed in overseas countries provided important information to the National Research Institute for Cultural Properties, Tokyo, and we expect further progress in the research in the future. An art catalogue is a brochure that is handed out before items in an individual or a family’s collection are sold at sale place on a certain date. An art catalogue features photographs and it lists the name and medium of artworks such as paintings, calligraphic works, and art objects. Such a catalogue is a vital source with which to determine an artwork’s provenance. Such catalogues enjoy a limited distribution, so only a handful of facilities nationwide curate auction catalogues as a whole. In its collection, the National Research Institute for Cultural Properties, Tokyo has a total of 2,532 art catalogues that were printed from the late Meiji Era to the Showa Era. The Institute has the largest number of these catalogues among public repositories in Japan. The Tokyo Art Club has long been involved in the sale of artworks since its founding in 1907.Over this period, the Tokyo Art Club has amassed a number of catalogues it has published. In the past, the National Research Institute for Cultural Properties, Tokyo recorded information in art catalogues on cards with attached photographs and made these cards available to researchers in the Institute’s Library. However, original art catalogues were often poorly preserved. 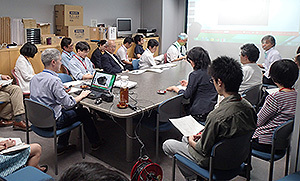 Thus, the Institute joined with the Tokyo Art Club to start a project to create digital copies of art catalogues. This project will fully reproduce older art catalogues (i.e. catalogues printed prior to 1943) in the collections of the Institute and the Tokyo Art Club in digital format. These images and information will then be shared in an effort to preserve these important sources. Reproducing images and information in these art catalogues in digital format should further enhance databases of important materials in the Institute’s collection.